North America to South America. Europe, Africa and Asia. Oh, the places we’ll go to procure high-quality flowers. We’ve previously told you about our regular trips to Bogota, Colombia, which has an ideal climate for growing roses, for instance. Day three found Tom Royer and Geoff Royer again in Bogota, again inspecting Valentine’s Day roses, this time at the Multiflora farm. Now the only thing they do in the field is sort the roses, long-stem vs. short stem. Now there’s a post-harvest building where the roses are graded more accurately, prepped and packed in boxes for shipping to customers such as Connells Maple Lee. Their farm tours completed, Tom and Geoff are heading home. 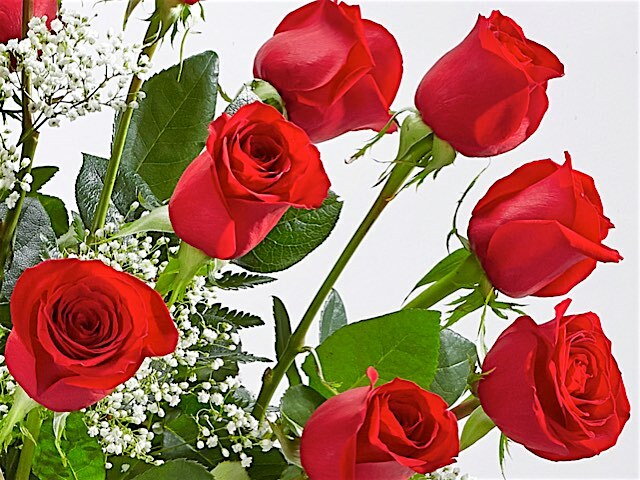 Tom will make one more stop, however, flying to Miami for another inspection of the Valentine’s Day shipments, ensuring the highest quality before the flowers are packed on our truck for delivery to our Grove City distribution center. There, our employees will handcraft thousands of holiday arrangements using the roses, carnations and other Colombian-grown flowers that Geoff and Tom saw firsthand only days earlier. A tag identifies flowers destined for Connells Maple Lee. While they’re getting ready to play a big football game in Houston, Connells Maple Lee is gearing up for its version of the Super Bowl with our annual pre-Valentine’s Day trip to South America. Tom Royer, our senior vice president and chief operating officer, has been making the trip for decades. In recent years, he has been joined by his nephew, Geoffrey Royer, who is a company area manager. Day 1 found Tom and Geoff at the Liberty and Mira Monte farms in Medellin, Colombia, from which Connells Maple Lee mainly purchases daisies and cushion poms. Whatever their current products, the farms aren’t resting on their laurels. They work with breeders to create the varieties of flowers that Connells Maple Lee and other florists purchase. Far be it for us to quibble with “The Bard,” but names do matter when it comes to distinguishing among rose breeds. This certainly is the case with our standard red rose, which is anything but standard. Known as the “Freedom” variety, it has been our primary rose since its 2004 introduction by the rose-breeding experts at Rosen-Tantau in Germany. The pure-red Freedom rose, which is grown in South America and Mexico, is known for being a productive plant that is highly resistant to pests and diseases. What’s more for consumers, the Freedom rose makes a big impression with its deep color, size (flowers range from 5 to 7 centimeters across), and long vase life. Shakespeare referred to roses more than 50 times in his writings. Napoleon’s wife Josephine grew more than 250 rose varieties. Archeologists discovered fossilized remains of wild roses that were more than 40 million years old. The world’s oldest living rose is 1,000 years old and flourishing on the wall of Hildesheim Cathedral in Germany. The rose hips (the part left on the plant after a rose has finished blooming) contains more Vitamin C than almost any other fruit or vegetable. A local florist will give you the best value for your money, according to NBC News. Love is all around at Valentine’s Day, but you never want to take matters of the heart for granted. Our survival guide is here to help, before, during and after the holiday. And it’ll help you whether you’re giving or receiving flowers — or both. One of the keys to a successful Valentine’s Day is not forgetting that it is Valentine’s Day. Order your flowers early and even have them delivered early. This way, you’ll be sure to stay ahead of any snowstorms, and the recipient will just have longer to enjoy the flowers. What’s more, Connells Maple Lee offers a special incentive: Have your Valentine’s Day order delivered Feb. 12 or earlier, and the delivery will include a coupon for a free dozen-rose bunch redeemable in March. The big national retailers will spend a lot of time and money bombarding you with their offers, but you’ll get the most bang for your bouquet when you purchase it from a local florist. Don’t take our word for it, though. Just watch this story from NBC News. Be wary of “deceptive order gatherers,” or DOGs, that often make it look like they are local florists but aren’t. They might even be located out of state. And if they sink their teeth into your order, they’ll take an unnecessary bite out of your wallet. Click here for details on why you will want to avoid them. It’s the thought that counts, so you don’t have to spend a lot to show that you care about someone. From a single rose or a stuffed bear to a mixed bunch or mixed-color roses, you can find many options for below $50. Given proper amounts of water and cool-enough temperatures, high-quality roses from a local florist can last a week or longer. Just follow these easy steps. With these tips, you’re not just going to survive Valentine’s Day, but you’re going to thrive. Valentine’s Day is just around the corner, and so are your roses. Connells Maple Lee is on site in Colombia, South America, where our flowers are being cut, processed and shipped for delivery to our Grove City distribution center. This hands-on approach ensures the highest quality product will be in our stores and delivered to homes and businesses throughout Valentine’s Week.